Fast setting, fiber reinforced road repairing mortar, with superior resistance against compression, impact and vibration.Suitable for road repairs, after utility crews (telecom, electricity, and water) complete their work. Repair around storm drains, manhole covers and road excavation sites. It is also ideal for mounting road signs and very effective for installing metal posts or steel angles when installing wire fencing. 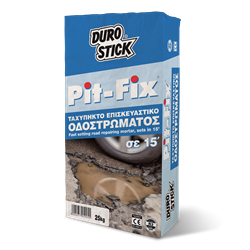 It is recommended for gap filling on roads due to vehicle traffic and between railroad rails. Classified as concrete repair product in category PCC R3, per EN 1504-3. 2kg PIT-FIX will fill a volume of 1lt.